Bali — One of the most romantic destinations in Asia, with beautiful beaches and affordable accommodations. 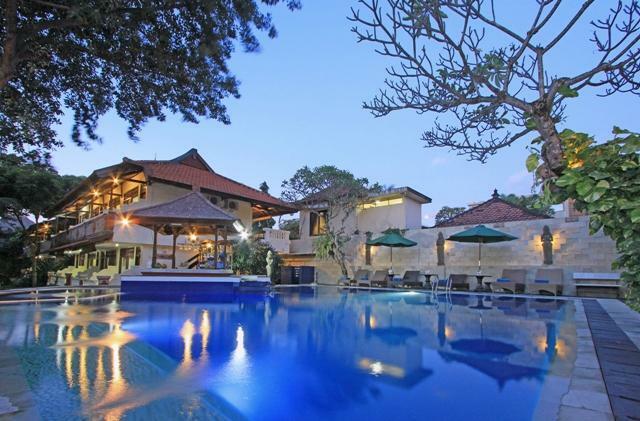 Bali can either be really cheap or super expensive. If you are looking for a budget hotel with a nice swimming pool, friendly staffs, great service and amazing location, you are in the right place. As a hopeless romantic person, it is a must to provide your partner with the most romantic holiday stay ever — without burning your wallet too much. It is hard to narrow down a great hotel with amazing location, services, space, and atmosphere when facing a tight budget. Thus, the work is done for you through this article! Click on the name of the hotels or resorts to access their official websites for more information. It is best to Google for best prices instead of directly booking from the hotels/resorts’ websites. Located just 25 minutes away from the famous sunset beach Pantai Batu Belig, Favehotel is one of the favorites for a romantic stay. Choose a standard room with balcony and a rice field view to enjoy your own sweet private time together with your partner for about 20 USD. On a good weather, you will be able to view the spectacular Mount Batur from your balcony. Enjoy a glass of beer or cocktail while soaking up the sun with your partner by a nice 1.4-meter deep swimming pool too! Possibly one of the most spacious hotel rooms in Bali for below 30 USD/night. 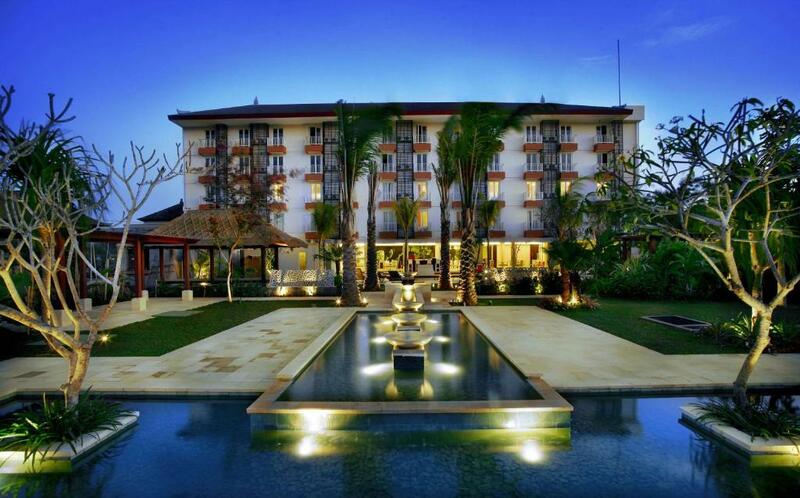 Taman Ayu is a traditional Balinese style resort located in the heart of Seminyak with a large size swimming pool. It offers Superior rooms (from 26 USD/night) to spacious private villas (up to 80 USD/night)— everything for your needs! It is easy to access good restaurants, pubs, and bars from this resort. Additionally, it takes only 10 minutes to walk down to Seminyak beach. Superior rooms in Sense Sunset is sized at 21 square meters and it is priced at about 22 USD! Beds are absolutely comfortable and soft to sleep in. Though the swimming pool is not as big as the one in Taman Ayu (above), it has nice shades to help you and your partner get away from the sun. The exterior of the hotel is colorful and striking — definitely compliments the name of the hotel. 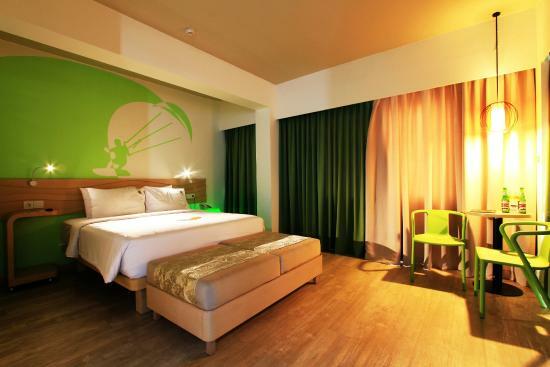 This contemporary hotel is 2 km from both Seminyak Beach and 3-D art exhibits at DMZ Museum, yet your stay is inclusive of a complimentary area shuttle! This 3-star hotel prices its rooms from 22USD – 32 USD. Hotel rooms are quiet and clean. It is also said that the restaurant in Alea Hotel serves up really great food! 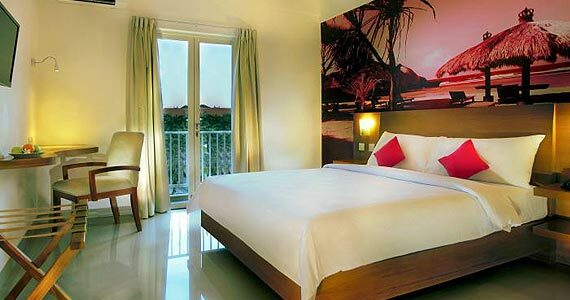 Additionally, it is located 10 minutes away from the hustle and bustle of Seminyak’s tourist’s attractions. It is easy to find though it does not have a nice view of paddy fields, beaches or mountains. The poolside lounge itself is tranquil and the additional open-air lounge outside of its restaurant is a good place to have some drinks with your partner after a long day of adventure. Believe it or not, your stay comes with free beers in the fridge! I love how the hotel names its rooms — Happiness, Max Happiness, Warmth, and Love Two. Sounds a little dorky, but it made me smile! Additionally, you can achieve happiness here from 22 USD onwards. Not only does Max One have an amazing swimming pool, they have a nice green rooftop where you can lounge on bean bags. Look up into the night sky and talk to your partner for hours – chat from your adventures, beautiful memories to a future together. 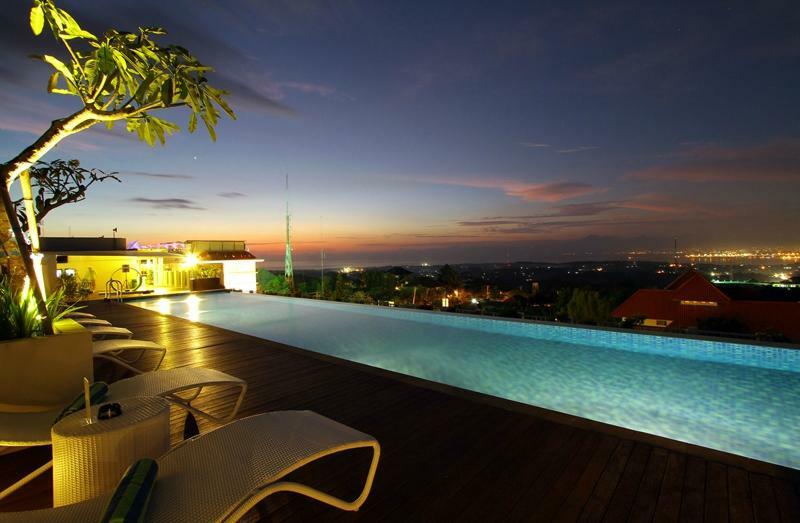 By the way, it is the closest budget hotel to Dream Beach and Rock Bar Bali!